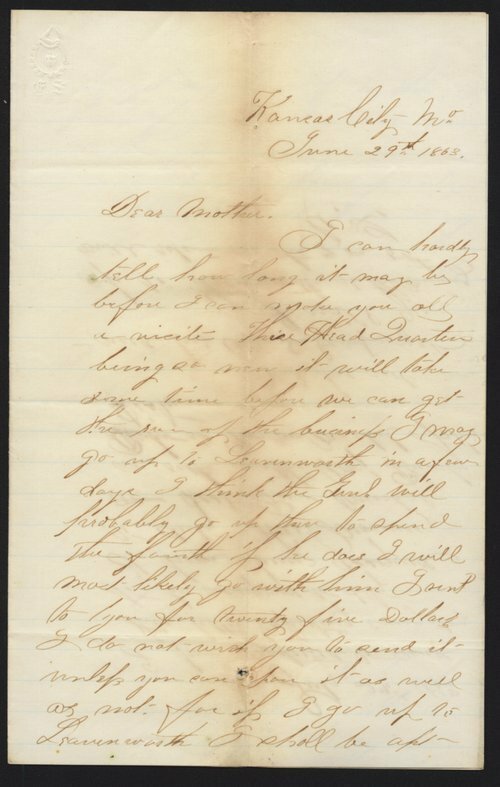 These letters were selected from a larger group of Civil War letters written by Cyrus Leland, Jr. primarily to his mother but to other family members also. Leland served in the 4th Kansas and later the10th Kansas Infantry, after the 3rd and 4th Kansas were consolidated to form the 10th. Many of the letters concern his efforts to be appointed as an aide-de-camp to General Thomas Ewing, Jr. Leland writes letters from Kansas City, Leavenworth, St. Louis, Rolla, and other places the regiment went. In a letter from Kansas City, Missouri, dated June 29, 1863, he asks his mother to send him $25 and to make him two white shirts. He also writes that he is staying at the Union House, along with some female prisoners. On stationery printed with "Headquarters District of the Border," he writes that General Schofield "has issued an order preventing the military of either Missouri or Kansas from crossing the state line without permission." A short letter written in pencil on October 12, 1863, about a military engagement near Boonville, MO, presents a contrast of letters written in the field to those written at Headquarters. Another letter written October 18, 1863, from "Camp near Carthage, MO, describes the capture of thirty Confederate troops. The letter written November 14th, 1863, describes an incident at a dance near Neosho, MO, that end with shooting. Leland ejected a soldier from "Blunts scouts" that was "a little more noisy than the rest" but when the soldier returned to Fort Scott, he told people he had been bushwhacked. Leland was from Troy, Doniphan County, KS. After the war, he served several terms in the Kansas House of Representatives. A complete transcript of the letters is available by clicking on Text Version below.